To insure radar hardware is setup and functioning properly the operator should perform several actions. Most states require a radar be tested by a certified shop periodically, typically once or twice a year. A sticker on the radar, or records, should indicate last calibration test, next (due) test, and who tested. Same requirements as radar calibration. Check Radar with Calibrated Tuning Fork(s). Two (2) tuning forks with different resonances required to test moving modes. Test Radar against Vehicle of Known Speed. Test vehicle should have a calibrated speedometer for a valid test. Best to run test at operational location. Set radar to Receive Only mode and scan for interference at operation site. The Range Control is actually the receiver sensitivity setting. Long range, most sensitive, may make the radar susceptible to local interference. The degree a radar self-test and automatically adjust circuits varies with model and ranges from none or little to testing 50 percent or more of the electronics. Self-test only checks and adjusts a portion of the electronics, the radar should also be checked with calibrated tuning forks before use. A police or sports Doppler microwave radar will register a speed from a vibrating tuning fork's narrow side, the higher the tone the higher the speed. A radar will also measure a tone from an audio speaker diaphragm. The radar is measuring the microwave reflection of the fork or speaker diaphragm - a complete end-to-end test. All radars come with tuning forks tuned for that radar. The supplied forks are the only forks that should be used to test the radar. The radar calibration certificate should include the tuning fork serial numbers that go with that radar. The forks should be labeled with, Speed, Radar Frequency, and Serial Number for tracking and accountability. A radar should be tested with tuning forks on a daily basis. The test should be conducted at start of shift, at a minimum. Some places also require the test when a citation is issued, and/or at end of shift. For dual antenna radars, the test should be conducted on each antenna. Testing the radar stationary mode is straight forward, place a vibrating fork a few inches from the front of the antenna, the radar should read the speed the fork is calibrated to induce. To start the fork vibrating gently strike the top side against a hard object such as wood or plastic, not metal. Once the fork is vibrating place it a few inches in front of the antenna. The fork's "side" must be facing the antenna to register a speed reading. Moving mode test is a little more involved and a little confusing. Two tuning forks with different tones are required to test moving mode. One fork simulates the patrol car speed, the other fork simulates a moving target reflection. The moving mode opposite direction traffic test is slightly different from the same-lane traffic test. 2) Put the SLOWER (Larger) fork in front of the antenna. 3) Radar should read slower fork as PATROL SPEED. 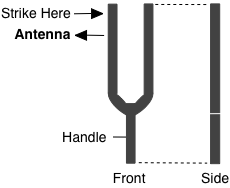 4) Put the FASTER (smaller) fork in front of the antenna. 5) Radar should read the DIFFERENCE in fork speeds. 2) Put the FASTER (smaller) fork in front of the antenna. 3) Radar should read faster fork as PATROL SPEED. 4) Put the SLOWER (Larger) fork in front of the antenna. 5) Radar should read the SUM of the fork speeds. Below illustrations with tuning forks calibrated for 30 and 55 mph. 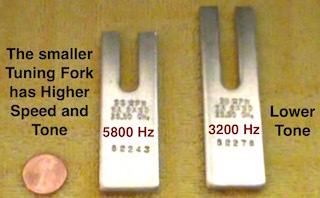 Each tuning fork should be calibrated (tested) every time the radar is calibrated. Tuning fork tone is measured in Hertz (Hz), which equals cycles per second (cps). Most police radars operate on a single frequency in the Ka band between 33.4 and 36.0 GHz. Police radars that operate in the K band use 24.150 GHz. Few police use X band radar (10.525 GHz) anymore. Most sports radars operate in the K band at 24.125 GHz, some transmit in the X band at 10.525 GHz. Radar frequency can be estimated from speed and tuning fork resonance. This is an estimate because there is some tolerance in the fork tone, and the equation has inherent rounding errors when calculating transmit frequency. Radar transmitters sometimes transmit out of design specifications, causing a speed error. The tuning fork test will always catch this error, radar self test will sometimes miss this error. The greater off frequency, the greater the error. A higher frequency produces a low reading, a lower frequency produces a high reading. Police Ka band radar operates between 33.4 - 36.0 GHz. Some European countries use X band radar at 9.41 or 9.9 GHz, or Ku band radar at 13.45 GHz. Internal radar test circuits cannot check everything requiring manual testing periodically, typically once or twice per year at least. Periodic testing of any measuring instrument is standard practice. All test should be documented and include date, test conducted, and results. A calibration sticker (BY, DATE, DUE) should be attached to the radar, or in records, indicating who calibrated the unit and when, and the date next calibration due. Any tuning forks used to check the radar should also be tested and labeled at the time the radar is tested.